David Moyes has been sacked as Real Sociedad boss. The Basque side are marooned near the bottom of La Liga - they are above the relegation zone on goal difference - and a limp performance in Friday's 2-0 defeat against lowly Las Palmas was the final straw. This is how his 364 days in charge went. After three days of speculation, the news was finally confirmed with a brief statement from the Basque club on Monday afternoon. "Real Sociedad would like to thank David Moyes and [his assistant, also departing] Billy McKinlay for the professional conduct, commitment and dedication which they showed during their roles in the running of the first team," the club said. "At the same time, we would like to wish them all the best in their future ventures, both professional and personal." The Scot leaves behind a team marooned near the foot of La Liga, and a limp performance in Friday night's 2-0 defeat against lowly Las Palmas was the final straw. The dismal display, as much as the result, forced club president Jokin Aperribay into holding crisis talks over the weekend. Aperribay did not want to rush into a hasty decision on the back of one bad game, but even after the dust had settled a couple of days later he still felt that a change was necessary. The official announcement was supposed to have been made on Sunday evening, but it was delayed for a few hours because Moyes's flight back to Bilbao from Manchester was cancelled. But once he returned to Spain on Monday and met personally with Aperribay, there was no need to delay the inevitable any longer and the former Everton and Manchester United coach's spell in La Liga was brought to a swift end. What was so bad about the Las Palmas game? After La Real's recent struggles, the trip to Las Palmas was always billed as a significant encounter for Moyes's regime, but the general feeling was that his job was safe unless his team delivered a disastrous display. Unfortunately for the former Everton and Manchester United boss, 'disastrous' is pretty much the right word to describe the way his team performed - or didn't - against a Las Palmas outfit which had previously only won one game all season. The hosts were clearly superior, deserved their goals from Jonathan Viera and Sergio Araujo, and were rarely seriously threatened by Moyes's team. It took no time at all for furious criticism to emerge from La Real fans - along with serious demands for the manager's head. Until Friday night, the majority of Real Sociedad fans were, while frustrated with their team's results and sceptical about Moyes's ability to turn things around, not yet ready to express outright hostility. But that all changed immediately after the loss against Las Palmas. 'Moyes' was a trending topic on Twitter in Spain after the game, with very few of the accompanying comments offering sentiments of support. Indeed, many of them finished with the hashtag #MoyesDimision ('Moyes resign') or #MoyesVeteYa ('Moyes go now'). The media was similarly critical, with a summary of the game in local newspaper Diario Vasco complaining that "when this team takes one step forward, it takes two back", and adding that their efforts on Friday night had been directed by "impulse" rather than a clear plan. As noted by Mikel Encinas, the editor of newspaper Mundo Deportivo's coverage of the club, the main cause of anger was not the result itself but "the image presented by the team". Most damning of all was a comment piece by Diario Vasco's Inaki Izquierdo, who concluded that Moyes "still bears the impression of someone who has only just arrived and doesn't understand the club, the players, the league, the city, the opponents, the referees, the languages, the stadia, the timetables…"
Moyes himself accepted that Friday's performance was below standard, acknowledging after the game that "the players have to improve, and so do I". However, he also refused to quit, insisting that he wants to stay with the club until the end of the season, when his contract was due to expire. But Aperribay did not feel the same way and Moyes was fired on Monday. Initially, the appointment of Moyes in replacing Jagoba Arrasate a year ago prompted enthusiasm in San Sebastian, especially when his first two months in charge yielded a creditable draw in the all-important local derby against Athletic Bilbao, and an improbable home victory over Barcelona. But the early bout of positivity gradually subsided into indifference and by the end of last season, which saw La Real finish in 12th position, the jury was still out. Fears that the team were destined for another season of struggle - despite a significant summer outlay in the transfer market (see below) - were further heightened by a mundane start to the new season which saw the team draw their first two games 0-0 and then lose 1-0 at Real Betis. Starting the season without a single goal in 270 minutes was not exactly the way to get the fans onboard, and a 3-2 home defeat against Espanyol in the next outing put Moyes under more pressure. Still, though, there was a widespread acknowledgement that the team's performances had deserved more: Espanyol's winner was a scrambled effort in injury time, and La Real had created chances to take at least a point from the game at Betis. A 4-0 win at Levante at the end of October bought Moyes some more time, and although that was followed by a 3-2 home defeat by Celta Vigo, it was widely thought he would be given until Christmas at least. But then came the debacle at Las Palmas. Whatever complaints Moyes may have about his time in Spain, insufficient backing from his board in the transfer market cannot be one of them. 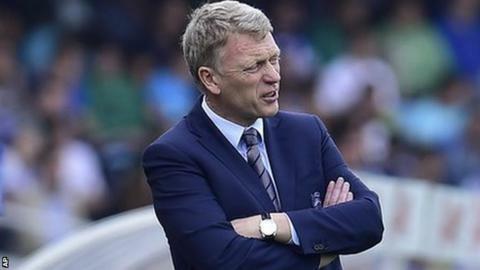 Considering the size of the club and their relative lack of resources, Real Sociedad spent heavily in the summer to put the most expensive squad in the club's history at Moyes's disposal. The biggest signing was midfielder Asier Illarramendi, who was brought back 'home' from Real Madrid after a disappointing couple of seasons at the Bernabeu for a club record fee of about £12m. Another big money signing was Brazilian striker Jonathas, who had impressed last season with Elche, while the arrival of Portuguese winger Bruma on loan from Galatasaray was another which increased expectation. The club's board also secured the services of highly rated young Argentine goalkeeper Geronimo Rulli, 23, who had spent the previous season on loan at the Anoeta and attracted serious interest from Valencia. The team's failure to progress despite such a heavy outlay is likely to have been a major factor in the club's decision over the future of Moyes. After their experiment with an overseas manager, Real Sociedad have quickly returned to their native shores by lining up Eusebio Sacristan as their next boss. The former Spain midfielder recently left Barcelona after four years in charge of the club's B team, and his experience in developing young players will be crucial at a club which is reluctant to make more big waves in the transfer market. But there is also plenty of pressure on Aperribay, who put a great deal of his personal reputation on the line by making such a big effort to snap up Moyes a year ago when a deal had already been drawn up to appoint ex-West Brom boss Pepe Mel (now back at Real Betis). Many fans have included Aperribay in their criticism of Moyes, arguing that if the decision to appoint the Scot has proven to be erroneous, the man who made that decision should also be held responsible. Moyes himself inevitably faces questions over exactly why he failed in Spain. He will believe that he was unfortunate to be dismissed so early into the new season, and that the quality of players at his disposal was not good enough to meet the expectations of pushing for a Europe League place. But he is already facing criticism for failing to make sufficient effort to integrate after failing to properly learn the language or develop relationships within his club, as well as claims that his tactical approach was not sophisticated enough in a league where team strategy is very important. A version of this feature was published before Moyes's exit on 7 November 2015.